My final paper is about doubles in the Alice books, and I thought I’d share some of my side research on the blog! These are some photos from two separate shoots by two contemporary photographers, Lorenzo Agius (x) and Annie Leibovitz. In “Photographic Wonderland” Franz Meier argues that the Tweedle brothers act as a stand-in for the medium of photography: you cannot see their backs, they are uncanny doubles, and they are so life-like you lose track of whether they are or are not actually alive. Agius’s photograph flips this idea on its head: we see both the back and front of the person depicted. 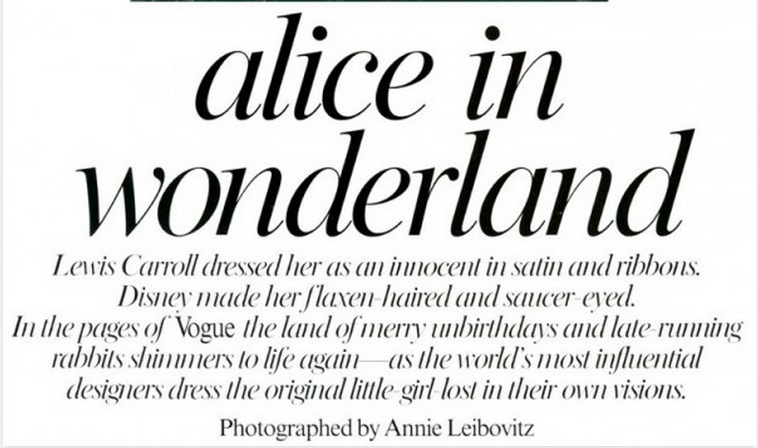 Annie Leibovitz shot an extensive series of photographs for Vogue, featuring prominent fashion designers posing as Alice characters alongside Natalia Vodianova, who was dressed in the designer’s particular dress design. What fascinates me about these photographs is the role of the designers — their creations (Alice’s dresses) allow them into the photograph, where in a way they create duplicates of themselves. The photo of Alice with the Tweedle brothers is another interesting take on that aspect of the book: here Alice poses similarly to the brothers, receding into two-dimensional photographic reality. Without Alice to investigate the Tweedle brothers, what happens to them? Do they remain motionless, frozen? This photo raised an interesting possibility for me: if the Tweedle brothers are representative of anxiety about mirrors, photographs, and other objects which capture likeness, perhaps the anxiety specifically concerns what happens to our likenesses when we aren’t around to observe them. Do they vanish? Do they live on as fragments of our faces and selves? Do they become gross distortions of our features and personalities? I’m really interested in the female Tweedledee/Tweedledum image in this, especially in relation to the idea of their standing in for photography. You mention that Agius’s photograph flips that idea on its head a little, since you can see the back and front of the “image”, but I wonder if there’s not more to it than that? Not only is the woman in the photo “reversed” in that she’s standing with both her front and her back to the camera, but her clothes are reversed as well – when she’s facing away her outfit seems like it would more typically be the front, although her shorts and shoes are facing away, and the vice versa for the front-facing woman. There’s other inconstancies too: one woman has her hand propped on her hip while the other lets her’s hang; one is looking directly at us and the other is in profile (instead of the exact opposite, which would have been looking directly away); the glasses aren’t mirrors (both have the right eye punched out); the center line of the picture is not actually the center. At first glance this image wants you to believe that these women are mirrors of each other but closer inspection reveals that’s not at all the case. I also find the distance between them interesting, compared to the description of the Tweedles in the book, or even their depiction in the second image in this post; they’re always portrayed as claustrophobically close – conjoined, even, to throw back to our class discussion – and yet here these two women are putting as much distance as they can between themselves, barely touching. I don’t really have a conclusion to draw from these observations, unfortunately, just that I noticed them and thought they were interesting.